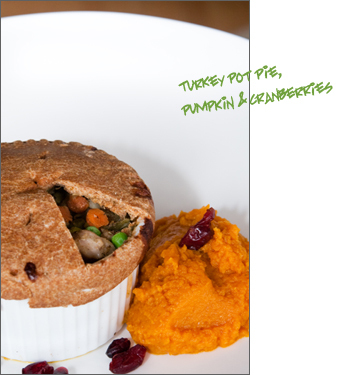 Preston’s thanksgiving dinner this year looks better than Mommy and Daddy’s. Another thing making this thanksgiving super special is that the long-anticipated Animal Planet Dogs 101 Puggle episode finally aired this weekend. Preston got a lot of emails from friends who saw him on TV. It was a short appearance but long enough to make Mommy, Daddy and Preston very excited! If you missed the show, you can catch a short online version. 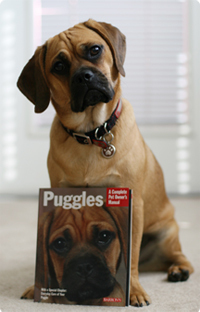 All the puggles that made the show are so adorable. Preston attempts to stand out by barking and howling at the camera and it worked! Preston is cheering for himself. 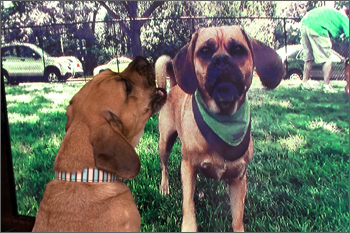 Dogs 101 filming: Puggle Meetup. 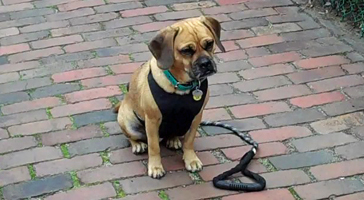 A couple of weeks ago, Preston’s puggle buddy Bruschi talked about his new Wacky Walkr® Urban leash in his blog. It is a short elastic leash that is perfect for dogs who like to pull. Living in a city (with a real wacky walker like Preston), Mommy especially appreciates a short leash that allows her more control when walking on busy streets. 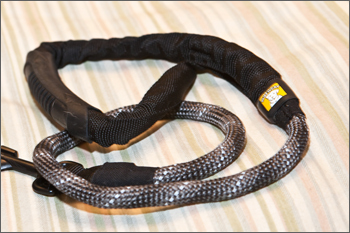 Mommy would like to share another great short leash option – Knot-a-long® leash by Ruffwear. The handle of this leash is very comfortable to hold on to. The material is extremely lightweight yet durable. The length of the leash is 2.5 feet (it is not elastic) and great for keeping Preston by mommy’s side (as seen in Preston’s NYC trip). 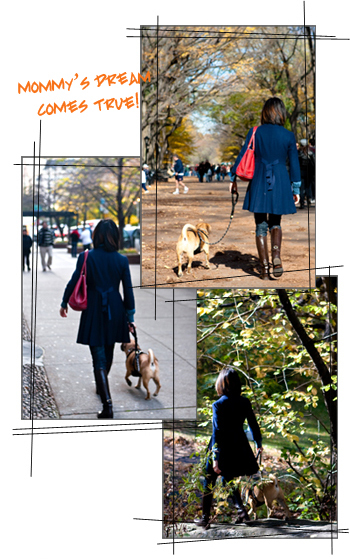 Does Knot-a-long® leash magically transform Preston into a perfect walker? Not quite…but here is Preston’s best “on-leash” walk. 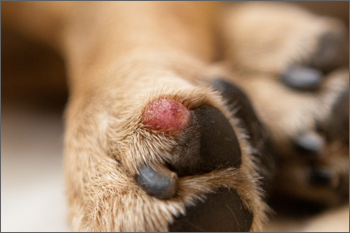 Two weeks ago Mommy found a small blistery bump on Preston’s paw. It started out tiny and quickly grew into a pea-sized red lump within a week. It was sensitive to touch but did not seem to affect Preston’s walk eventhough it was very close to the pad. Mommy had it examined by the doctor. 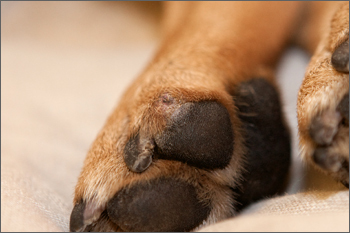 The cytology has confirmed that Preston has histiocytoma. 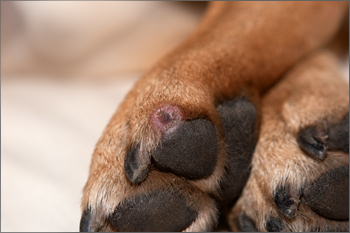 It is a benign skin tumor that usually occurs on young adult dogs. In most cases, the tumor will regress on its own in two to three months so Mommy is taking the doctor’s suggestion to let the tumor run its course. 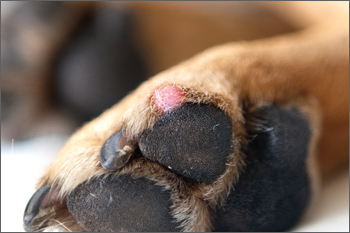 If it does not go away in three months or starts bothering Preston, surgical removal might be necessary. Hope it goes away by itself soon! Update: week#5: The tumor started shrinking. 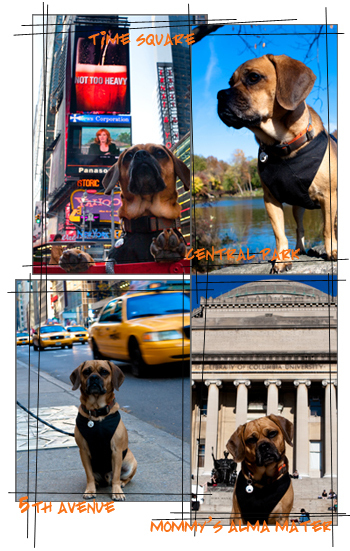 When Mommy went to school in New York City years ago, she often dreamed of walking her dog on NYC streets and Central Park. This weekend, Preston helped Mommy realize her dream. Preston has left his mark in many places in the city!